The latest screen adaptation of Thomas Hardy's novel. "Cutting a swathe between stuffy British period drama and the crassness of Baz Luhrman and Joe Wright, Vinterberg has created that rare breed of classic literary adaptation that strikes the perfect balance between respecting the material and delivering cinematic thrills." It's a damning indictment of the dearth of good female characters in mainstream cinema that one of the best roles of the year for an actress comes in an adaptation of a novel written six score decades ago, but in Thomas Vinterberg's adaptation of Thomas Hardy's Far From the Madding Crowd, Carey Mulligan's Bathsheba Everdene is one of the most exciting and endearing protagonists we'll share an auditorium with in 2015. Bathsheba of course lent her surname to Katniss, Jennifer Lawrence's protagonist of the Hunger Games series, and when we first glimpse her, clad in tight auburn riding leathers, she resembles the heroine of some contemporary superhero movie. An educated but relatively poor young spinster, she prides her command of her animal, her environment and her destiny. When neighbouring sheep farmer Gabriel Oak (Matthias Schoenarts) asks for her hand in marriage, she resolutely declines, despite the comfortable life he could afford her. Soon after, fate deals a disparate hand to both Bathsheba and Gabriel; the former inheriting her uncle's large farm, the latter losing his entire flock in a tragic accident that leaves him bereft of penny and shelter. Their fortunes now reversed, Gabriel takes a job on Bathsheba's farm as head shepard, keeping a watchful eye over her flock and her actions. 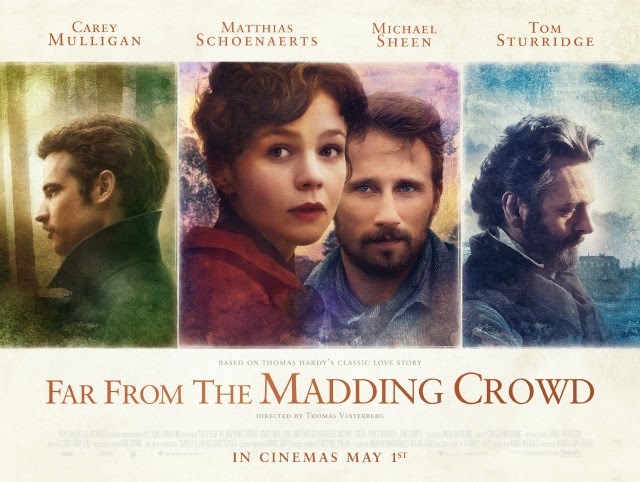 Though Gabriel's fingers are singed by the candle he still holds for his employer, Bathsheba finds herself torn between two other suitors; the melancholy middle-aged landowner William Boldwood (Michael Sheen) and young roguish soldier Sergeant Frank Troy (Tom Sturridge). The period drama is one of the most marmite genres in modern cinema. There's a huge audience, mostly consisting of Anglophile Americans, that laps this stuff up. Personally, I find it a bloodless, uncinematic genre best left to Sunday evenings on BBC. While Europeans have given us some effective period dramas, the Brits revere their literature too much, and the result is usually stagey, overly wordy filmic adaptations (Andrea Arnold's almost wordless Wuthering Heights the one great exception). Hiring Thomas Vinterberg, the Danish auteur behind Festen and The Hunt, proves a masterstroke, giving us a fresh look at Hardy's Wessex. Vinterberg shoots rural Britain with a foreigner's fascinated eye, much like Wim Wenders' Texas of Paris, Texas. There's nothing polite about this adaptation, and I can't recall so much as one cup of tea being consumed. With burning barns, thunder storms, unwed mothers and crimes of passion, Vinterberg gives us the best looking Dallas episode we've ever seen. His take on Hardy owes more to the melodramas of golden age Hollywood than late 19th century English literature, evoking the sumptuous works of Douglas Sirk in the same way he drew on the social dramas of the '50s for The Hunt. Mulligan (who once again is afforded the opportunity to belt out a tune) and Schoenarts make for a loveable, sad-eyed screen pairing. Driving us to despair in frustration at their stubbornness regarding their mutual feelings, it's impossible not to will them to get together. Sturridge makes for a great mustachioed cad, and Sheen is a portrait of pathetic melancholy. But the work you'll most remember is that of cinematographer Charlotte Bruus Christensen, who gives us some of the best portraits of the rural British Isles since David Lean's day. Cutting a swathe between stuffy British period drama and the crassness of Baz Luhrman and Joe Wright, Vinterberg has created that rare breed of classic literary adaptation that strikes the perfect balance between respecting the material and delivering cinematic thrills.